There are two kinds of people out there. Those who love to travel and those that don’t. Those that don’t love to travel probably like the comfort of their on home and do want to step out of their comfort zones. That probably hate the airline queues and all the associated drama with going to another place. While some people might not understand the reluctance to go out and see the world everyone should be accepted as they are. There is no need trying to change someone who doesn’t want to be changed. Then there are people of do love to see the world. Who want to travel and see all the wonders of this great planet before they die and experience all of life’s wonders. Whether by train, bus, car or plane they are willing to take the next step and get out of their comfort zones to expose themselves to all this world has to offer. When these people chose to do that it is a good idea to come prepared. And it gives companies huge opportunities to share the experience which them through the provision of free promotional items which can be used on their travels. A great travel item is the luggage strap. Luggage straps are a staple for anyone’s travel accessories. Luggage straps are great for a number of reasons. Safety – They keep you luggage safe by offering an extra layer of security. Where you have a combination look or just a regular clip they help prevent luggage being tampered with during transit. Potential thieves with be dissuaded from trying to remove a very visible luggage strap that will make them get noticed. Visibility – It is alway easier to identify your luggage coming around the carousel when there is a colourful luggage strap wrapped around it. So with all these things in mind imagine how great a promotional item this nifty little product is. Indeed during my recent travels, when I asked passengers, four out of five said they would love to receive a promotional luggage strap as it is such a practical item. 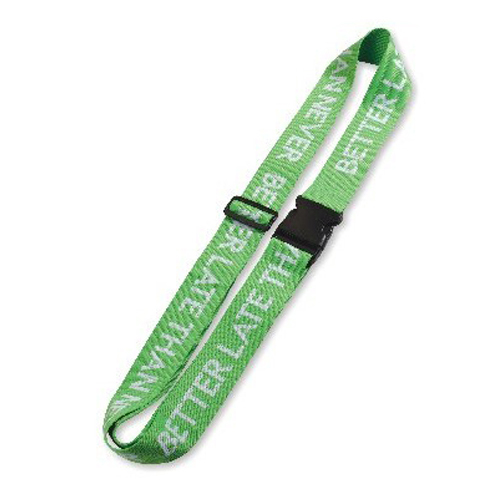 So if you are looking for a great promotional item such as lanyards or luggage straps give EzyLanyards a call.